My interest in recording burst beyond the studio walls from my earliest productions. I realized environmental sound could greatly reinforce the impact of music (and vice versa), and I was discontent using stock sound effects. I soon discovered that great adventures awaited when recording in the field, such as stalking a bull moose for its lunchtime snorts, ambushing a thousand caribou in Alaska’s Arctic National Wildlife Refuge to record their clicking ankle tendons, or recording the gulping laps and glassy dripping of a melting iceberg moments before seeing it collapse in a thunderous (and potentially deadly) display. I have since acquired an extensive toolkit, and library of sound effects in stereo, M/S, quad, 5.1 surround, and binaural. Following are a few sound examples and their backstories. From an early age when camping with family, I was fascinated by the unique natural EQing of sounds as heard from within the tent, and those sounds bring back fond memories. I suspect anyone who’s been camping will immediately recognize these tent sounds and have their own emotional reaction. 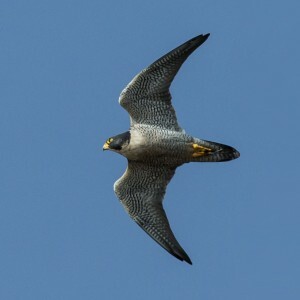 No sound is more poignant that the cry of the Peregrine Falcon, as the sound was nearly erased from nature’s musical score due to the pesticide DDT and other environmental impacts. Today, the falcon thrives and it’s cry is an important texture in the soundscape of the wild, for its sonic prevalence, its mastery of the air, and for its important reminder of nature’s fragility. While producing an album about the cultures and ecology of Taiwan’s northeastern Yilan region, I learned of an underwater volcano off the coast of Turtle Mountain Island. This was the terminus of a subterranean river of boiling-hot water flowing from the hot-spring riddled plains of Yilan, under the ocean floor to Turtle Mountain Island. Using my scuba skills, a team of divers and two custom DPA hydrophones, I recorded the thunderous, gushing and pulsating volcanic hydro-thermal vents 40 meters below the surface, in scalding waters which at times exceeded the boiling point. 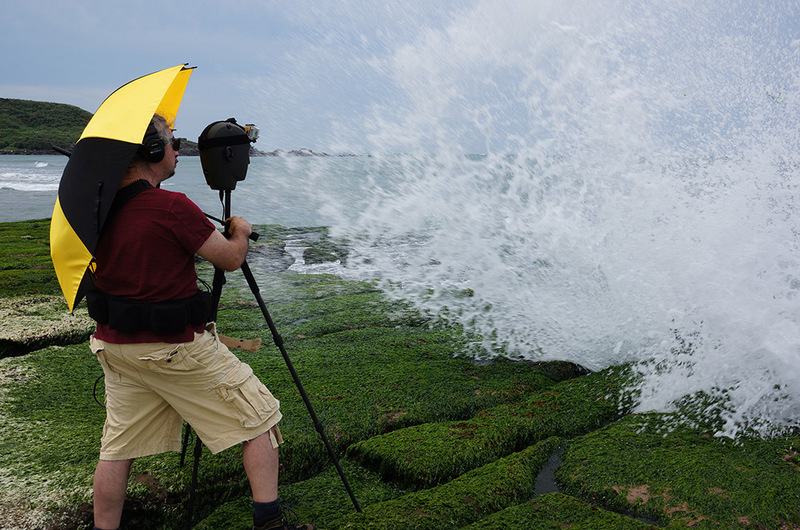 Although stereo recording is not generally attempted underwater where sound travels too fast for the brain to perceive location, two hydrophones were employed to great effect thanks to the motion of plumes, bubbles and gasses as they belched past the mics in the ocean’s current. The beauty of this rare recording within the resulting album earned the highest music honour in the Mandarin music world — a Golden Melody Award. Many have heard of the Pikachu animation, but few are familiar with its namesake and its sound in the wild. 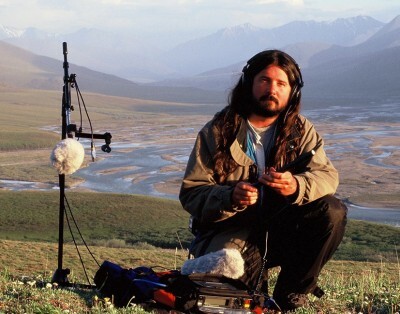 Picas inhabit much rocky terrain in Canada’s arctic, which caused me to seek the sound for its importance in representing the sonic canvass for albums celebrating northern wilderness and culture. The trouble is, this animal isn’t fond of humans, and is fond of burrowing labyrinths to evade the stealthiest observer. One day, armed with my belief that nature gives something to those who try, I set out to record picas. But after hours without success (and relentless taunting by several picas from afar), it started to rain. In utter hopelessness, I sought shelter for my recording gear ― especially for the microphone which is covered in a round, furry wind diffuser. If that gets wet, no sound could reach the mics inside. An overhanging boulder proved helpful and the mics was placed underneath ― luckily and unknowingly at the front door of a pica tunnel. Upon hearing a talkative pica less than a meter away, I turned to see a pica emerging from it’s tunnel, engaging my furry microphone in vivacious conversation. I realized then, how much the mics’ wind diffuser resembled a plump pica. The sound provided for you here is, first, purely pica, and then, as heard within the context of other arctic environmental sounds. Carefully switching on my recorder, I captured what is surely the most “in your face” pica sounds in the history of recording… and of picas. Searching for traditional sounds in Taiwan’s Yilan County, I travelled to the heart of Wujie village, where the temple was often the site of festivals and ceremonies. 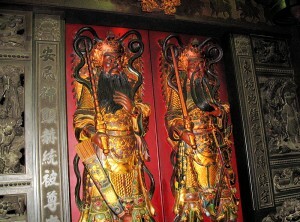 That’s where I discovered a sonic gem ― the ancient hinges of the great wooden temple doors. Positioning an M/S stereo microphone in four positions for natural imaging, I recorded each hinge one by one while slowly closing the moaning ― sometimes wailing ― temple doors. Later in the studio, each hinge was layered into its natural panning position, and the resulting sound effect is a stunning tribute to Taiwan’s Beiguan temple culture. Spatial audio has fascinated me from my earliest production years. Binaural recording ― the use of microphones which are placed into the ears of an anatomically accurate human head-shaped housing to capture lifelike 3D sound ― was familiar to me, but this technology had been relegated to the niche-pile due to its reliance on earphones for playback in an era when hi-fi speaker systems were the norm. Seeking technologies to bring greater space to my productions, I investigated other “transaural” systems such as QSound, Desper Pro Spatializer and Roland’s RSS system, and also worked with Sony’s SACD team to employ transaural processing in 5.1 surround sound ― a pioneering accomplishment which earned a Canada National Research Council grant. In today’s internet-driven music and video environment, more people listen to music on earphones than in the history of recorded music, and it occurred to me a few years back that binaural’s time had come. This is because, when we listen to typical recorded music with earphones, the audio seems to be inside our head due to the absence of aural locating information which our brain requires to externalize sound. This loss of space in earphone-delivered audio creates an unnatural and ― when combined with recent trends to over-compress music ― an unhealthy listening experience. We are learning to ignore the absence of spatial cues in a dumbing-down of our auditory faculty. But the emergence of earphones as a prominent music delivery format is gradually drawing binaural back onto the radar of the music production industry. Anticipating this inevitability, I’ve gathered extensive binaural field recordings and have used binaural to greater effect in each of my recent studio productions. “Impulse responses” are digital fingerprints of a reverberant acoustic space which can be superimposed over other recordings to make music appear to have been recorded within a given space. Imagine singing in your living room, and adding an impulse response from the Taj Mahal. My passion to push the boundaries of binaural has led me to the groundbreaking application of binaurally-captured multi-directional impulse responses paired with directionally-matched binaural studio recordings. The results of this undertaking are forthcoming. 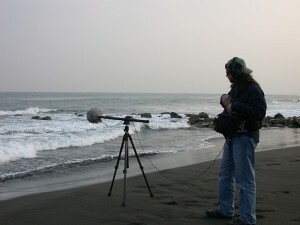 In this era when technology has truly rendered all the world a stage, pioneering approaches to audio production yield innovative techniques for adapting to a new reality ― and in the case of binaural, also restores much-needed acoustic space to music. 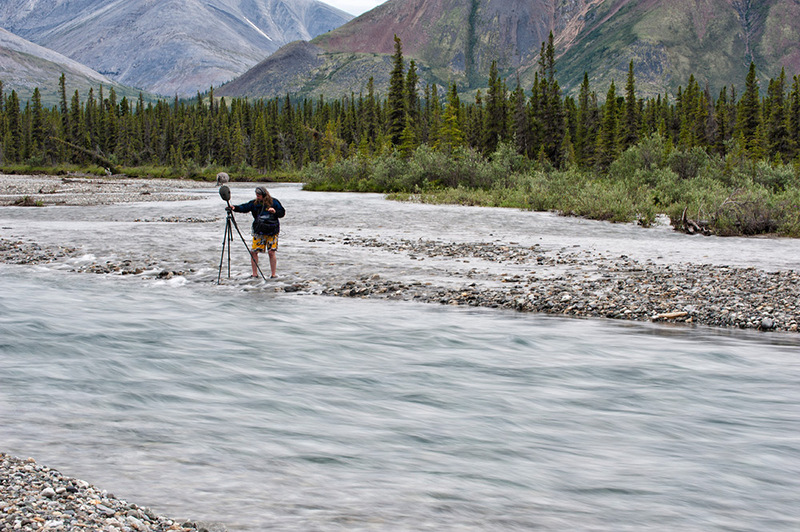 When recording water, it’s important to seek the clear dialogue. Otherwise, as with people, when too much water is talking, its impossible to comprehend. In this audio excerpt, I have provided you with several minutes of beautiful waves which, if heard with earphones, seem to wash right up to the sand around your feet.